Friends – the situation has turned deadly. Children are literally dropping dead from cardiac arrest in schools with wifi. Full article is below. Please note that schools in the U.S. are getting paid to install very dangerous wireless systems in their buildings by those who control the Common Core curriculum. The FCC (i.e., the murderous Federal Communications Commission whose leaders should be executed on sight for the harm they have caused humanity and all life forms) has agreed to spend $3.9 billion per year in order to coerce schools and libraries to install these deadly, cancer-causing technologies and thereby expose massive numbers of children to harm. Even though children are literally dropping dead, school authorities are making out like bandits while refusing to address the harm this is causing. I agree wholeheartedly with Barrie Trower. Those who agree to put wifi in schools should be locked up for the rest of their life as they are not fit to walk the surface of this planet. We have got to act now to stop these monsters from killing our children. “When their findings don’t fit his business model. When they don’t like the message, they disparage the messenger. At my own child’s school at Mountainview Elementary in Collingwood, Ontario. We bypassed the opinions of these business people and we went right to the source, much like a journalist would. And we asked the MOTHERS if their kids were healthy. And we got a consistent answer from about half of them. For 18 months they’d been in and out of doctor’s offices with a range of neurological symptoms. By coincidence it was 18 months when the school installed the WIFI. And we found out that at least 4 children had erratic tachycardia, that confounded their doctors and they were wearing heart monitors to school. The older children who were a little more aware of their bodies told us they had blackouts in certain areas of the school. One even said he couldn’t hold a pencil inside the school. And these were all symptoms that occurred daily during school and disappeared on weekends and holidays. We found out the school board had installed a wireless internet system powerful enough to run 300 computers at once and they thought it was awesome. There’s only 7 computers in the school using this system. The parents of the affected shall pay for hardwired connection kids can feel healthy again. But the school board said no, the children must be exposed to WIFI at school. Even the children who were sick and presented to the school board themselves were told “No, you may not plug your computer into the wall, you must sit all day in a sea of microwave radiation. Their reason, safety code says it’s safe. Safety code 6 says we don’t have to listen to your complaints. Safety code 6 is an excuse for everything. It was the only thing they had. They wouldn’t tell us when it was installed. They wouldn’t tell give us access to attendance records to figure it out for ourselves or when it started. We wrote to the school board officials, public health officials, Cabinet ministers We did all the due process you’re supposed to do and they all had the same cut and pasted answer, Safety Code 6 says we’re wrong – there are no health effects. Two children have dropped dead in Simcoe County schools since WIFI was installed. Their heart simply stopped beating. One was named Jetton. one was a little boy named Chase. It’s curious that this would happen twice to children just over 10 years old. There’s only 50,000 students in the entire school district. I did my research to find out if this was normal or abnormal. Turns out the estimate is 1: 1.3 million per childhood cardiac arrests. This was 20 times higher than expected. Far exceeds the level expected environmental influence. It should have been examined. It should have triggered a public health investigation. But it was only 2 kids, not a high number. Then it happened again. Another Simcoe County school, to a 13-year old who dropped from cardiac arrest in the schoolyard, lucky for him he was revived by a defibrillator after someone called 911. He evacuated to Sick Childrens Hospital in Toronto and had a pacemaker installed on his heart. Then within the year it happened again in another Simcoe County school, to a 16- year old boy. Who was brought back to life by his gym teacher using CPR. Evacuated to Sick Kids and had a defibrillator installed in his heart. This was 4 kids with cardiac arrest. It brought the observed rate of juvenile cardiac arrest within Simcoe County schools to 40 times the expected. The only response by the Simcoe County School Board has been to install defibrillators in 100% of the students. I alerted the Simcoe County Public Health Department about an illness cluster in our school that I believed deserved investigation. I was told that according to Safety Code 6 this was IMPOSSIBLE and did not warrant investigation. Levels of safety that were determined 3 decades ago and are being applied to a different world. The 21st century schools are washed in microwave radiation. Children don’t like to stay home from school. The special interest groups have called themselves Skeptics say ‘it’s all in their heads’. So how would they scientifically explain erratic tachycardia, measured on a heart monitor? Child’s heart rate moves from 68 beats per minute to 200 per minute in a single beat? How is that heart monitor measuring something that’s in the child’s head? One parent asked if her son could be moved to the back of the class, away from the transmitter because he had a headache. He left for school healthy every morning and developed headaches shortly after sitting down at his desk. The teacher said “no”. The school board told him he’s not allowed to move any student, based on an illness from WIFI, because it doesn’t exist. His mother removed him from school permanently, the kid doesn’t go to school anymore, as a mother WOULD who instinctively protects her children. This 9-year old boy became 1 of many in Simcoe County, including my own, who didn’t go to school anymore. 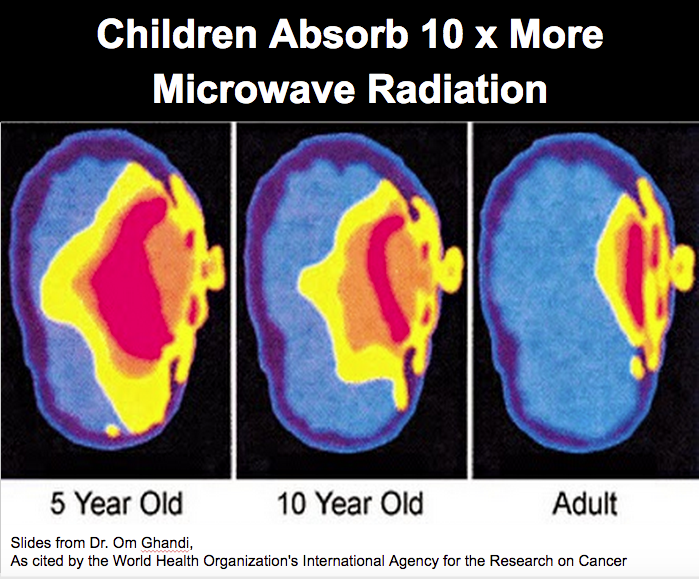 As this little boy can’t tolerate microwave radiation, despite health promised. The school board measured the levels of microwave radiation, and I’m sure this question is popping up in your mind right now – what was the measurement? Their goal was to compare the levels in the school to Safety Code 6, which we questioned. We questioned these levels and we believe they’re inadequate. But, they were going to measure it against Safety Code 6, probably so they can shut us up once and for all because we were causing so much trouble. Except, what happened SHOCKED even the school board. The very first location where they measured, exceeded the microwave levels that trigger heating reaction. It exceeded the upper threshold of Safety Code 6 by 34%. And I’ll be happy to supply you with this document. So, we were right! Our kids were sick at school and nowhere else. There was no mold problem, no recent renovation, chemical building materials. Only a newly installed massive WIFI system. They measured and found that radiation created by the WIFI exceeded Safety Code 6 thermal threshold by 34%. And that explained how my son came home from school with hot ears every day. He was being cooked by microwaves. When we finally found out about the test, that we were right, they changed their approach to Safety Code 6. They now said that Safety Code 6 upper limits can be exceeded 50 times. So they relied on Safety Code 6 until it became inconvenient and now they disregard it. They now expose our children to as much radiation as they want in order to connect 7 computers to the internet. No matter if kids are too sick to go to school. No matter if kids drop dead in their gyms. No matter if their own metric of what is too much radiation has been exceeded in a school where kids are commonly wearing heart monitors. This is real! You can look this up in the newspaper. Fast forward 3 years, my kids are safe. A local private school decided to dismiss Health Canada. Take its WIFI out to protect the children. I have to spend tens of thousands of dollars to enroll them and we have a perfectly good public school system. The school my kids go to chooses to keep them safe while the public school system chooses to intentionally expose them to microwaves that exceeds Safety Code 6 limits. A Grade 8 boy from school had to leave recently because he developed Pancreatitis, he’s 13. I’ve been told by doctors who are pediatricians that they’ve never seen this before. A Grade 8 boy in the next school over developed cancer recently. Is it because of the WIFI? Well nobody knows because nobody’s going to check. Not even when the kids going to drop dead in their gyms are they going to check. So why is it that nobody pays attention to this obvious problem? I suspect that Health Canada is manipulating the system. I’ve seen their officials mislead reporters on national television. 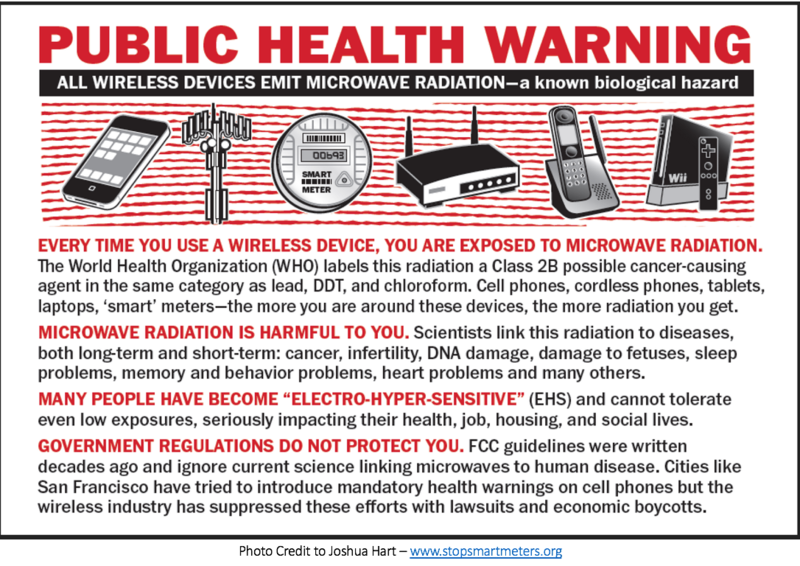 Stating that there is no evidence of biological effects of microwave radiation below thermal levels, when there is plenty of evidence. Stating that kids and fetuses can tolerate 50 times more radiation than thermal threshold. There’s no evidence for that. Not anywhere in the literature. I’ve had serious Biologists and Physicists tell me that Health Canada officials look like fools on this subject. Part of my 5-year journey for the truth on this matter, has lead me to several medical conferences. There are doctors gathering annually in the United States who are grappling with the increasing number of patients in their offices with sudden onset of chronic illness. So far they report that the symptoms can abate if they turn off their newfound wireless devices, but it’s tough when the entire health system is perpetuating the lie that their symptoms are fake based on the deeply flawed document that we’re discussing today. Because Safety Code 6 has fallen behind the times. You’ve heard only from a small fraction of them today. The Global Mail newspaper reports that Womens’ College Hospital in Toronto is admitting 5 new patients a month into their environmental health clinic. The Complex Chronic Disease Program says they’re overwhelmed by medical referrals for electrosensitivity and they can’t keep up. These are both government funded programs, using government funds to examine and diagnose the very illnesses that Safety Code 6 says it can’t exist. That’s largely because the way the evidence model is weighted in favor of science paid for by the wireless industry. As you all know science can be manipulated, but cardiac arrest can’t. Two kids drop dead and Simcoe High Schools weren’t vacated, it wasn’t in their head. The two who revived aren’t imagining the devices planted in their little hearts, those are real. What I urge of you is to rise above the mudslinging and the pretend science. And be the ones who finally show integrity after all this time. You might think your cast is limited in stone, but you are in the unique position to provide a tool to the lonewolves on school boards who might want to take precautionary action. You could suggest that dramatically safer standards set in places where children are forced by law to spend 6 hours a day for their entire childhood. Right now, the entirety of Canada’s youth are exposed to levels of microwaves that if described as an experiment, it would not pass an ethics committee. You can’t gather data by exposing children to a classified possible carcinogen, but we do it every day in every Canadian school without collecting any data. Anyone would make the argument and safely spray any amount of pesticide on any person for any amount of time, although that was once thought to be ok, and that’s the current government thinking with microwave radiation. The arc of this public health disaster is still on its upswing. Today you have the opportunity to tip it in the other direction. Simply led health candidates know that stricter safety standards are required for children and pregnant women. Let them know they should ignore any science sponsored by the wireless industry and start relying on independent scientists. Children know one thing instinctively – that it’s wrong to tell a lie. As long as we pretend that no one’s suffering, this entire process is a lie. Let’s start acting like children. Panel member: You made a comment when you focused on Safety Code 6, do you seriously think this panel has not read Safety Code 6? Rodney Palmer: I don’t think that for one minute, sir. Rodney Palmer: I apologize if I offended you on that. Rodney Palmer: Is this your only comment on my speech? Part of it may have been rhetorically me zoned in on that a little bit. Panel member: I just have a question – you mentioned that there was a report of a case that a school that had exceeded Safety Code 6 regulations. Rodney Palmer: Yes, would you like the report? Panel member: I’d like it, yes. Rodney Palmer: I just gotta comment on that for a moment. If you look at the page I’ve handed you, in the circle, they valued this experiment where 1 equaled valued threshold of Safety Code 6 and that measurement was 1.34. Now I’m a manufacturer and I have to adhere to certain rules of the Canada Standards Association and Underwriters Laboratory for my products, so I’m very aware of what safety testing is about. When you find an abnormal or a reading exceeding the standard, you immediately try to repeat it. So, they did this with one laptop. They opened a single laptop and they tested and they found that when they touched the device to the laptop it exceeded Safety Code 6. Now instead of going to a second laptop to see if they can repeat it. They closed the laptop and did not commit that particular experiment for the rest of the day. They then went to the high school after 3 o’clock when all the students and all the little devices were gone home and measured there. So, I would submit that this particular test was flawed and perhaps intentional. However, they did let that reading show to their credit they didn’t fake it, however the school board took four months to let it be known it was THE #1 issue in the Simcoe newspaper. It was THE #1 issue at every school I was at and they never told anyone and they had to find out. Rodney Palmer: You know, my thoughts on why they don’t do it are my own, I really don’t know. Only that perhaps somebody who’s reached the pinnacle of the Public Health Department is more political and bureaucratic than they are medical anymore. And what they value more than is hierarchy. Then this is again my only my sense of it. Um, but it’s a fact, and I have said these things which could be actionable and I’d be happy any day to stand before a judge and show the evidence. Panel Member: Any other comments? Questions? Panel member: Do you have a copy of your comments? Panel member: Yeah if you want to send it, send it. Rodney Palmer: Sure, I can officially submit it, sure. Panel Member: And Russel can give you the email address. Panel Member: I’m not a member of the panel, actually I lied that’s my only comment. Rodney Palmer: Thanks for admitting it. Rodney Palmer: You’re welcome to challenge any of the facts. And I’d be happy to represent them. Panel Member: I just wanted to challenge you on the question. Have they read it? Well, you couldn’t expect the panel NOT to have read it. I think it was a bit of a facetious remark. Rodney Palmer: It may have been off script and I apologize if it offended you, I’m sorry. Panel Member: **Inaudible** It looks like this is a peak field measurement with probing direct contact. Panel Member: **Inaudible** For Safety Code 6 is whole body exposure and for time average or time, so… I don’t see that this as its peak measurement **inaudible** was intended necessarily to conflict with Safety Code 6. If you measure the field **inaudible** antenna of a cell phone, you get field levels that require above Safety Code 6, that measurement doesn’t really apply to this case. Rodney Palmer: Umm, that’s an excellent question. Panel Member: We can discuss this offline. Rodney Palmer: No, it’s not necessary to discuss it offline because I can answer this very quickly. If you read through the report, and this was discussed, they used a device that kept the measurement tool a certain distance from, so even though they touched it the actual measurement device was a certain distance away. And secondly, the comments from the School Board Superintendent, where they did discuss the fact, that yes it had exceeded the measure, the engineer who did the measurement admitted that it had exceeded and he began to belittle it to say a child would have to hold a computer on his head to have any effect. And I don’t believe Safety Code 6 has any disclaimer that if you exceed it, as long as you don’t touch it to your head, you’re ok.